Change jaw sets in less than 2 minutes, without leaving the cab. * Weight includes mounting bracket to attach to excavator. ** Distance is measured from the attachment mounting pivot (boom or stick) forward. All Genesis GRX Razer tools are covered by a 12-month, 1,500-hour (whichever occurs first) warranty. The Razer X Multi-Jaw Demolition Tool (GRX) from Genesis Attachments enables excavator operators to change jaw sets in less than 2 minutes, without leaving the cab. 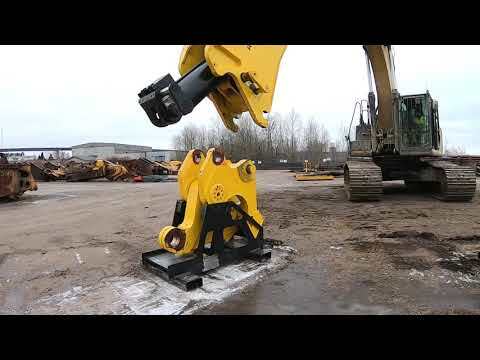 The attachment body contains hydraulically-actuated pins, controlled from the cab, that connect to the cylinder and jaw set. This enables the operator to change jaws without assistance, and while staying in the cab, making change-outs faster and safer. The Razer X is available with cracker and shear jaws to process a variety of materials, and each GRX jaw set comes with its own stand specifically designed for correct positioning and efficient handling. Additionally, the GRX features bolt-on and reversible wear parts to simplify maintenance, and a flat-top head with bolt-on bracket makes it easy to change lugs for different carriers.